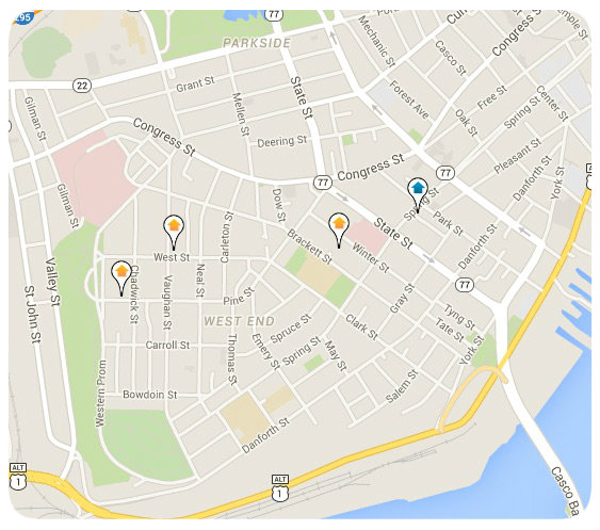 Portland Maine's West End Neighborhood is one of the most architecturally stunning locations for Victorian properties. John Calvin Stevens is one of the most notable architects and you can't travel 2 blocks without an example of his design. The West End is geographically located on the Western Side of Portland's peninsula. Landmarks are the Western Promenade, which looks out over the mouth of the Fore River as it enters Casco Bay. Maine Medical Center, the State's largest medical center anchors the South West side of the neighborhood. Current West End real estate includes gracious single family Victorian homes, unique historic condo's and town homes, newer modern condo's and multi-family apartments. Price ranges offer a wide variety from smaller condo's for a couple hundred thousand dollars, to multi-million dollar Victorian properties. The West End is known for several popular neighborhood establishments for food and drink.